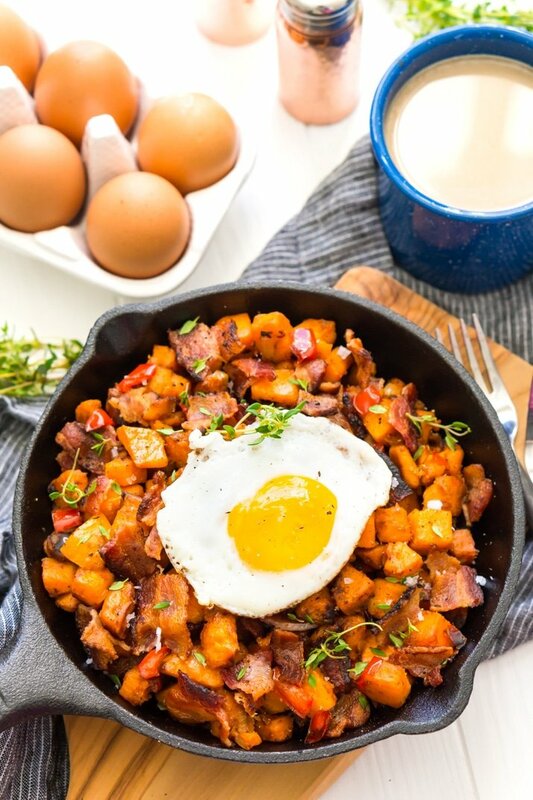 This Sweet Potato Hash is loaded with onions, peppers, bacon, and seasonings and topped with eggs for a delicious and hearty breakfast recipes! Happy Saturday! 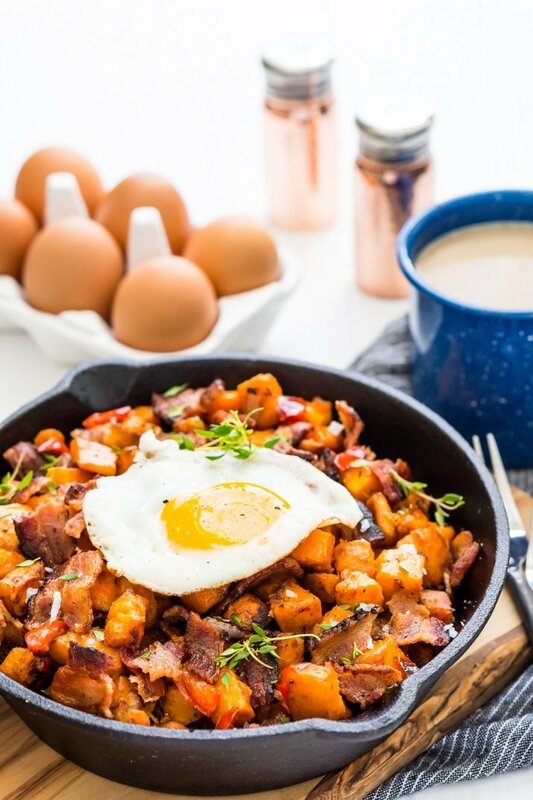 It’s raining here and a little chilly and this Sweet Potato Hash is perfect for mornings like today when you want to wake up slow and take a little time with breakfast (or brunch), that being said, it’s not an overly complicated recipe, but does take about an hour to prepare. It’s a cozy and delicious meal worth savoring. I absolutely adore breakfast hash. I grew up eating them and hardly ever make them anymore, but I always make sure to order them when I spot them on the brunch menu. The best one I ever had was at a little restaurant in Montreal, it makes me sad that I don’t remember the name of that cute little restaurant, but I’m sure I could find it when I go back again. 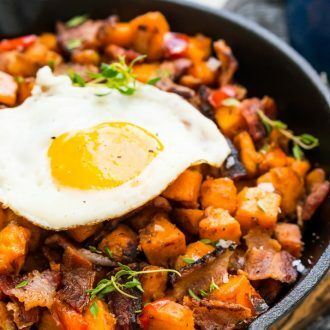 What Is A Breakfast Hash? Hash is a dish consisting of chopped meat, potatoes, and spices that are mixed together and then cooked either alone or with other ingredients such as onions or peppers. The name is derived from the French verb hacher (to chop). Now, I absolutely adore sweet potatoes! If a restaurant serves sweet potato fries, I’m getting them, and my Sweet Potato Casserole is one of my absolute favorite holiday side dishes! 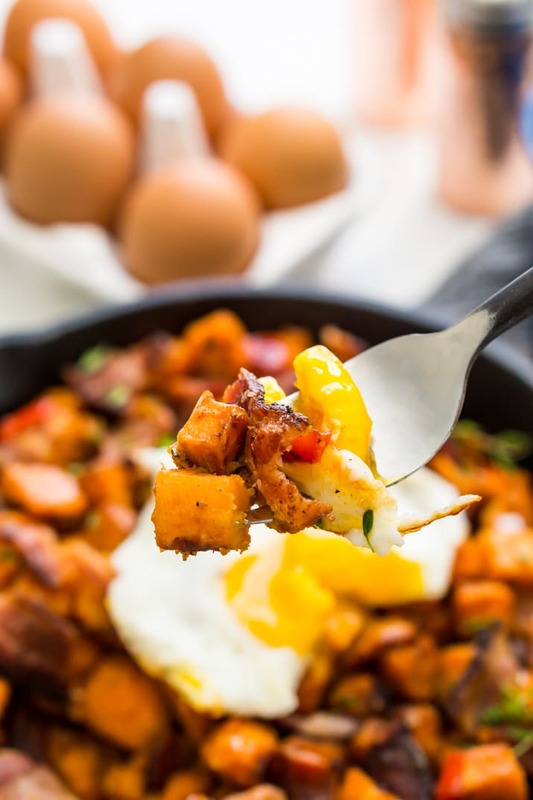 And I think they make a really great addition to breakfast and brunch dishes and this Sweet Potato Hash is no exception. I love the way the sweetness of the potatoes mixes with the salty bacon and the soft peppers and onions in this dish. 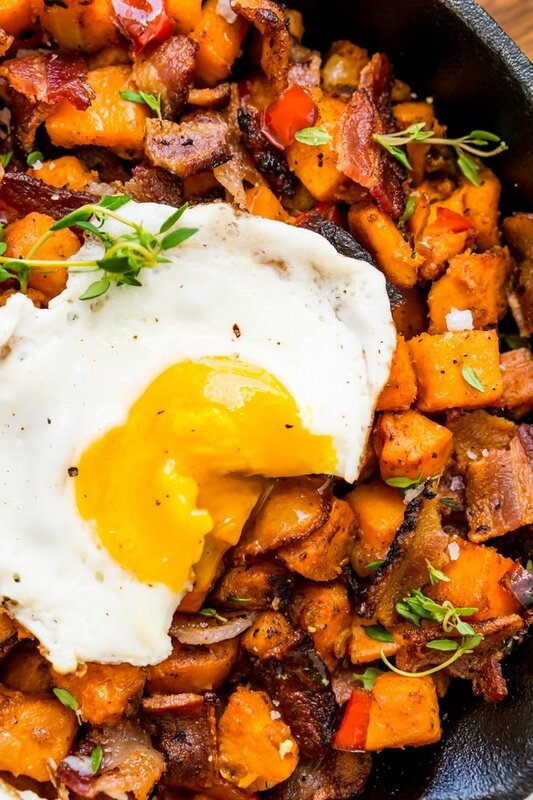 By reserving and using the bacon fat in the dish you add a whole other level of flavor that makes this sweet potato hash absolutely cozy. I know everyone likes their eggs differently, and you can make them whatever way you’d like before adding them to the hash, but I think they’ll taste the best with a soft, runny yolk which adds a nice richness to the hash. Even though the pictures show just one egg, the recipe calls for 4, one for each serving. The recipe was plated in a small cast iron skillet for photos. Add the butter to a large cast iron skillet over medium heat. Once butter has melted, add the onions and cook until translucent, stirring frequently. Add the sweet potato and bell pepper to the cast iron skillet and reduce heat to medium-low. Cook for 20 to 30 minutes until potatoes are soft. Meanwhile, in a separate large skillet, cook the bacon over medium heat until done. Reserve the bacon fat and chop the bacon up. Add the bacon pieces, about 4 tablespoons of bacon fat, thyme, cumin, salt, and pepper to the potato skillet and stir to combine. In the pan that you cooked the bacon, cook the eggs over easy. Transfer hash to plates or bowls and top each with an egg. Add salt and pepper to taste and serve hot. 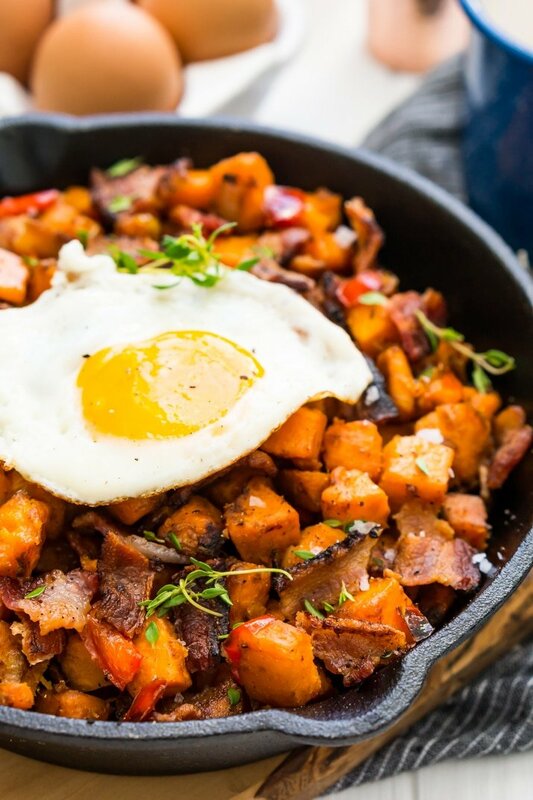 Pin this Sweet Potato Hash Recipe for Later! Thanks, Albert! The cumin adds a nice touch of flavor to the dish, that’s for sure! Now THIS is breakfast, wow! I bet the cumin and thyme really make the flavors of the bacon and sweet potatoes pop! They really do, it’s such a hearty breakfast! MMM, this is how I love to have sweet potatoes – more savory than sweet, swoon! I love sweet potatoes in all ways, but I totally agree, this is one of the best! Pan fried!